Migrants wait in a slow-moving line to collect money transfers sent by relatives back home, as a caravan of Central Americans trying to reach the U.S. border halts for a rest day in Tapanatepec, Oaxaca state, Mexico, Sunday, Oct. 28, 2018. 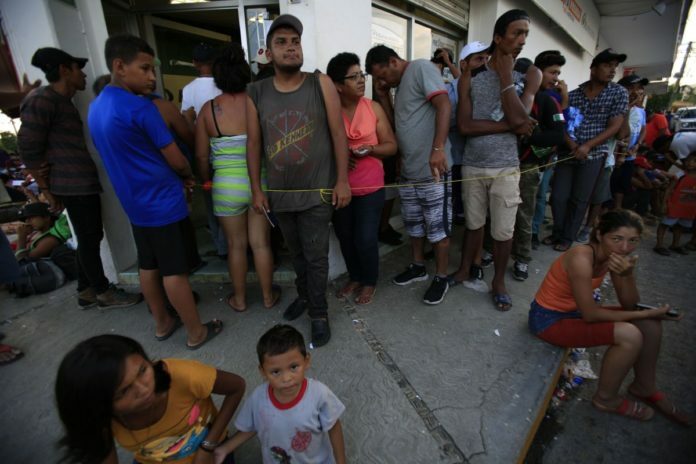 Thousands of Central American migrants took a break Sunday on their long journey toward the U.S. border roughly 1000 miles away, with Mexican government agencies seeming to waver between helping and hindering. About 5,200 active-duty military troops are expected to descend on the southwest border by the end of the week, but it is still unclear how many will be sent to the Rio Grande Valley. The troops will be joining more than 2,000 National Guard members that have already been deployed to the border. Their deployment was announced Monday afternoon during a joint news conference between Kevin McAleenan, commissioner of U.S. Customs and Border Protection, and Air Force Gen. Terrence O’Shaughnessy, commander of the U.S. Northern Command. O’Shaughnessy said 800 troops were on the way as of Monday and that by the end of the week 5,200 troops would join the 2,092 National Guardsmen already working Operation Guardian Support along the southwestern border. Despite O’ Shaughnessy’s assertion that the troops would be armed, he confirmed they would be prohibited from using their weapons. Posse comitatus prohibits the federal government from using the armed forces for law enforcement; similarly, the Guardsmen are working in a non-law enforcement capacity. In an email obtained Monday morning by The Monitor and addressed to U.S. representatives, the Department of Defense announced an approval of a request for assistance to provide “mission-enhancing capabilities” to the Department of Homeland Security and CBP beginning Monday through Dec. 15, the document stated. “This support is in addition to the previously authorized support to CBP’s Operation Guardian Support mission,” the email stated. The Department of Defense “will provide planning assistance, engineering support, aviation (rotary and fixed-wing) support, medical teams, command and control facilities, temporary housing for CBP personnel, and personal protective equipment for CBP personnel,” the email stated. According to one local U.S. representative’s office, they were told that deployed DOD planners will be working with DHS and CBP to determine where troops will be needed along the Southwest border, with a total of 5,200 expected to be in place by or about Nov. 5. “This support will enhance DHS’ ability to enforce its overall border security mission,” the email stated. The DOD’s support of DHS will be under the same authority given in April when the Trump administration deployed about 2,000 troops to the southwest border because of an apparent “surge” in illegal border crossings, the document stated. Although a caravan was also in route then, the administration attributed the deployment to the March “border numbers” and the caravan. When reached for comment, representatives with U.S. Border Patrol and CBP referred all inquiries to DHS and DOD. The news follows a week of statements from the president regarding a caravan of more than 5,000 people from Central America making its way through Mexico and toward the U.S.-Mexico border. As previously reported, more than 1,500 of the aforementioned group have applied for asylum in Mexico, some have returned home, and about 3,500 are still making their way up through the country. But the chances of more than 3,000 people ultimately making it to a U.S. port of entry are slim. Earlier this year a caravan of about 1,500 people traversed through Mexico with the intent to seek asylum in Mexico or the U.S., but only 200 made it to ports of entry between San Diego and Tijuana. It is not illegal to request asylum at a U.S. port of entry. Earlier in the day CBP officers in Brownsville wore riot gear, apparently rehearsing crowd control measures, while some troops from Fort Hood could be seen arriving at the Gateway International Bridge. CBP personnel could be seen at the Progreso-Nuevo Progreso International Bridge erecting additional fencing along both sides of the bridge, presumably in anticipation of large crowds. Late Monday afternoon U.S. Rep. Henry Cuellar, D-Laredo, welcomed the arrival of troops to the area. U.S. Rep. Filemón Vela, D-Brownsville, was more direct, characterizing the deployment as a political ploy orchestrated by the president, underscoring that the deployment would be complete Nov. 5, the day before the midterms. “Trump’s deployment of 5,000 military troops to guard against women and children migrants who most likely will never set foot on American soil is totally unnecessary,” Vela said in a prepared statement. U.S. Rep. Vicente Gonzalez, D-McAllen, said using military personnel was a waste of federal resources.